Any time a pilot talks about “airwork,” what they mean is what normal people think of as “flying.” Takeoffs and landings? No; instead, airwork is the performance of the basic maneuvers: climbs, descents, and turns. Saturday I had my first solo flight in the Bay Area; I’d had several in Pensacola, but the environment, airspace, terrain, and weather are different enough here that this felt a little like starting over. I got to the airport, preflighted my airplane, and then had to wait for a few other airplanes in front of me to get out of the way; in total I spent about half an hour just doing those two things. The weather was a little iffy. Afternoons in Palo Alto tend to be somewhat windy. The runway I was using has a heading of 310°, and the wind was coming from 350° at 12 knots. That means that there was a 6.4 knot crosswind, and my solo privileges are limited to less than a 7 knot crosswind. Luckily the wind didn’t pick up any! 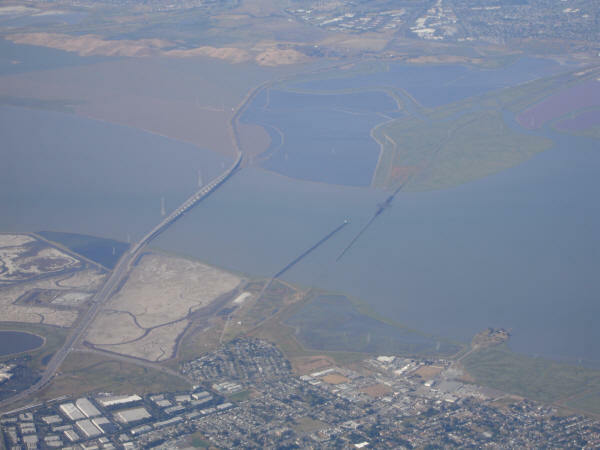 Once I was cleared for takeoff, I flew a right Dumbarton departure– that means I took off from runway 31 at Palo Alto, flew to the west end of the Dumbarton Bridge, and only then turned to the course I wanted. In this case, about 51° to take me out towards Sunol and the practice area we use. Different airports have different departure procedures. For example, in Pensacola you fly the “Skip departure”, named after Skip Giles (the chief pilot at Pensacola Aviation), which takes you between the toll plaza and the cluster of antennae at Midway, thence to the beach. As I mentioned in my first journal, there are actually two bridges: the one on the left (which is to the north) is the auto bridge, while the rightmost bridge is the train bridge. On arrival, you fly to the train bridge; on departure, to the auto bridge. The departure end of KPAO’s runway 31 is just off the bottom-right corner of this picture. Anyway, once I got to the practice area, I spent my time working on two different maneuvers. First is what we call slow flight. That’s just what it sounds like: you slow the aircraft down to minimum controllable airspeed (about 40 knots in this particular airplane), controlling power to climb or descend and using pitch to maintain the desired slow speed. In this flight regime the controls must be handled very gently, as the slow speed and high angle of attack means that they’re not as effective as they are at lower attitudes and higher speeds. It takes a delicate touch to turn, climb, and descend in this configuration, which is why I was practicing it, duh. The other thing I was working on are steep turns. Normal banked turns in an aircraft use between 10° and 30° of bank. Steep turns per the FAA’s definition use at least 45°. The sharper the bank, the more vertical lift is lost, so you have to apply enough back pressure on the control yoke to keep the aircraft from descending during the turn. The FAA standard is that you should be able to do a 360° turn at a 45° bank angle, rolling out plus or minus 10° and losing or gaining no more than 100′ of altitude. This is harder than it sounds, but I learned the key is to watch the angle at which the horizon meets the cowling or dashboard. If you apply enough control force to keep a constant site picture, then all it takes is an occasional glance at the heading indicator to know when you’re about to roll out again. My turns rapidly improved once I figured this out, although I find it easier to do them to the left than to the right. Something else to work on! Then I headed from the practice area over to the airport at Hayward, where I also have solo privileges. (In addition to weather and crosswind limits, your flight instructor will allow you to fly into a defined set of airports, which in my case includes Hayward.) KHWD is interesting for a couple of reasons: it has two parallel runways, which means that you must be careful to land on the runway you’re assigned to and not the one next to it. (See this picture to see what I mean.) Another is that it’s right under the approach airspace to Oakland International, which means that when you’re in the Hayward traffic pattern there will often be 737s (or even larger aircraft) 1000′-1500′ above you. I found the airport with no problem, got clear for runway 28L, made a great approach, and then blew it by starting my flare too high. The result: a bouncy landing, probably my worst landing ever. I did, however, maintain airspeed control. This is critically important because if the airplane’s speed gets too slow, it enters an aerodynamic stall, which is not what you want to happen on approach. I’ve struggled a bit with this but nailed the approach at a steady 70 knots. The bounce was embarrassing but luckily no one at Hayward knows me– so don’t tell ’em it was me, OK? After taxiing back, I took off again and flew back towards Palo Alto; the airplane was due back so I only had time to shoot two landings there, plus one go-around. One thing non-pilots sometimes don’t understand is that going around, a procedure in which you follow the “four Cs”, is a pretty normal procedure. You don’t try to salvage bad landings; if your approach speed, angle, or height is bad, or if the runway isn’t clear, just go around and try again. (What are the four Cs, you ask? Cram in power; climb to a safe altitude; communicate to the tower that you’re going around; and comply with whatever they tell you.) In this case, the tower ordered me to go around because the aircraft in front of me was taking too long. My two landings at Palo Alto were good, despite the crosswind, in part because my airspeed control was good, so I felt pretty good about them. Performing maneuvers at minimum controllable airspeed is demanding but fun. If you can do it precisely, it’s a good feeling. Bouncing your aircraft is bad. Controlling your airspeed on approach is good. Solo flight is very rewarding. I have solo time on Tuesday and Wednesday this week– expect more journals! I’ll be doing more steep turns, emergency procedures, and probably some navigation work. Remember that stalls can happen at any speed, Paul.